This more-like-cake-than-cookie cookie is super soft and generously topped with half chocolate icing and half vanilla icing. The large size (over 4" in diameter) makes for a super satisfying dessert. We ship these desserts in packages of 2. Black and White Cookies Full Size, 2 ct. has been added successfully to your wishlist. 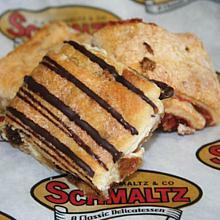 It's the age-old question - chocolate or vanilla? Our Black and White gives you the best of both worlds. Once found only in bakeries on the East Coast, the Black and White cookie has gained a cult following. When you were younger you might have shared one of these jumbo cookies with your sister, giving her the vanilla and keeping the chocolate for yourself. But now, if you're going to share it at all, you know it's best to give each recipient a little bit of each flavor. That's the way to keep the peace. If you haven't had one of our jumbo black and white cookies, you are missing out! This more-like-cake-than-cookie cookie is topped with half chocolate icing and half vanilla icing. The cookie part is super soft and not too sweet. It's the fondant icing on top that brings this cookie to a whole other level of goodness. Our Black and White cookies are always a crowd pleaser. Will you eat the chocolate or vanilla first, or will you take a big bite right out of the middle? There are currently no reviews for Black and White Cookies Full Size, 2 ct., but you can be the first! Chicken Soup - Kreplach, 1 qt. 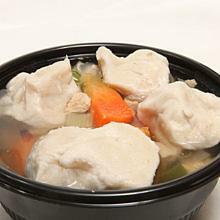 Schmaltz's famous chicken soup is made fresh daily with chicken, onions, carrots and other seasonings and include six kreplach.